In this session we meet to discuss possible directions for History Lab's future during this semester and the next. From intriguing documentaries, academic papers to potential guest speakers, any bright ideas are welcome! 15th October 2015 History Lab - Edward Turner, 'Revolutions: a selective force for the secular state?' paper and discussion. The National Archives have agreed to deliver a workshop to all those interested. The session will be from 1:30 to 4pm and will be hosted by TNA's Principal Modern Domestic Record Specialist Dr Paul Carter, and Reader Adviser Katie Fox. Know how to weigh up the evidence in these papers. 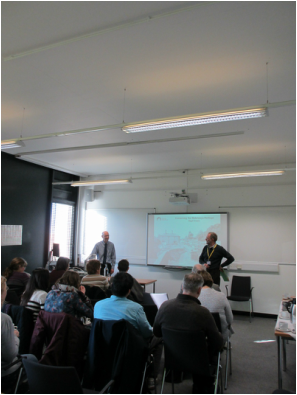 19th November 2015 History Lab - Nathan Bend, 3 minute presentation on research; Megan Webber, Public Engagement Project. 3rd December 2015 History Lab - Utopia. A reflection on the recent SSAHRI conference and a broader discussion on utopian ideas. Wednesday 27th January 2016 History Lab - Dr James Kneale, Department of Geography, UCL 'The prohibitionist's pub and the teetotaller's wine cellar, 1840-1914'. 1pm Law Court Building room W030 -Lunch provided. Dr Kneale will discuss how hard it was to separate drink from temperance over this period, based on the apparently not unusual occurrence of teetotal individuals and companies owning pubs. Wednesday 10th February 2016 History Lab - Chris Day, The National Archives - Speaking on 19th century public health and the General Board of Health. 1pm-3pm, R140 - Lunch provided. Thursday 3rd March 2016 - PG Training Session from 12-1pm (for those attending), followed by History Lab at 1:30-3pm - both held in R023, lunch provided as always. Simple, Dramatic, and Bias? : The problems of 'selling' History to a modern audience. As the title implies, I invite everyone to consider the possible complications associated with engaging the general public. This can come in the form of documentaries on 'mainstream' television (i.e. BBC), exhibitions, or other forms. - Qualifications of scriptwriters and presenters; should non-historians present History? Thursday 17th March 2016 - PG Training Session from 12-1pm (for those attending), followed by History Lab at 1:00-2:30pm - both held in R023, lunch provided as always. Simon Langsdale (UH) - 'Making Letters Live': Edward Johnston and the Commemoration of the Dead of Two World Wars. Given that a few of us are working on poor relief, welfare more broadly, and/or charity, I thought the following documentary would be an interesting discussion topic. If possible please view the documentary before the session. We may have time to show some of the documentary in the session, but not all of it. Thursday 12th May 2016 - PG Training Session from 12-1pm, 'How to present your first conference paper', followed by end of semester social, both held in R141, lunch provided.